Trooper Tommy Cooper takes measurements of the accident site. Amanda S. Young, 25, was seriously injured and her two-year-old daughter was killed in a 12:18 p.m. Monday car crash on Sunny Slope Road. State Trooper Tommy Cooper said Ms. Young was identified by her driver's license. She is in serious condition at Vanderbilt Medical Center in Nashville. The investigation into the accident is continuing. "We are still gathering information," Cooper said. The child, identified as Shea Hooper, was properly seated in a child restraint seat. Young was driving a 1996 Saturn four-door and was traveling south on Sunny Slope. It was the only vehicle involved in the accident. "While negotiating a left curve vehicle 1 went off the roadway, traveled down an embankment then went through a fence," the trooper said. 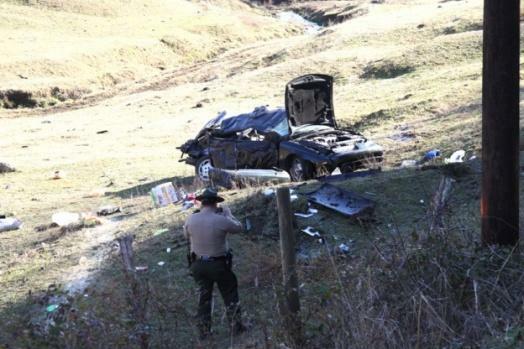 The car then struck a dirt embankment in the field and rolled over, he said. "Driver was ejected from the vehicle. The roof of the vehicle was crushed down on top of the child restraint device," Cooper said. "The car was full of groceries. I don't know if she was returning home from the grocery, that is yet to be determined," he said. The accident occurred about 2.5 miles from the Woodbury City Limits. The narrow, Sunny Slope Road has no shoulders or traffic barriers.